Brooks’ most versatile all-terrain shoe, the Adrenaline ASR 11 provides waterproof, breathable Gore-Tex protection and a stable, cushioned ride for moderate overpronators. Learn More. Light, minimal, and rugged, the New Balance 007 adds an aggressive outsole and climbing-inspired upper to the popular Minimus platform. Learn More. 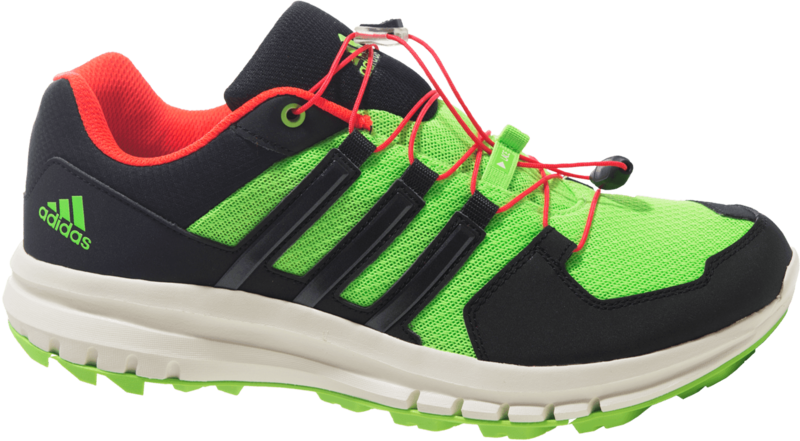 The Duramo Cross combines the best of Adidas’ running and outdoor technologies. Discover plush comfort with off-road stability and traction. Learn More. "The legendary off-road performance of the Speedcross 3, enhanced with a Gore-Tex membrane and in a color you won’t find anywhere else. " Learn More. Designed with the rugged mountains in mind, the Lone Peak 2.0 combines signature Altra technologies like the Zero Drop Platform with a host of trail-specific features. Learn More. The Ultra SST was conceived to do one thing: float over tough trails for more miles than you ever thought possible. The natural feel of ShapeShifter technology and a second-skin fit make it possible. Learn More. The award-winning Peregrine 5 is a super lightweight, stable shoe that’s built to excel in a wide variety of trail types and conditions. Learn More. Foot protection, custom cushioning, and a nimble feel in tricky terrain make the Cascadia 10 a favorite for running on any kind of trail. Learn More. The revolutionary Fresh Foam midsole of the NBX 980v1 delivers maximum cushioning and comfort out on the trails. Learn More. With its oversized CMEVA midsole cushion, low weight, and a trail-specific outsole, the Stinson ATR has a reputation for making rough trails feel like smooth pathways. Learn More. Running in the rain, snow, sleet, slop, and slush can get pretty cold and pretty old, so Brooks designed the Adrenaline ASR 11 GTX Men&apos;s Trail Running Show to keep your toes dry and comfortable when the going&apos;s less than totally pleasant. By incorporating a waterproof and breathable Gore-Tex membrane into the synthetic upper, Brooks ensured that you&apos;ll never have to take a rain check on your run again. Of course, the Adrenaline also sports plenty of Brooks&apos; other feet-pleasing designs like a cush anatomical DNA midsole, moderate cushioning, and 12mm drop, all based on a grippy rubber sole that won&apos;t make running down slippery trails feel like you&apos;re skating on ice. 1. Gore-Tex Membrane: Waterproof, breathable protection that’s ideal for wet and wintery weather. 2. Segmented Crash Pad: Independent shock absorbers in the midsole provide the right amount of cushioning and a smooth heel-to-toe transition. 3. DNA Midsole: Innovative midsole cushioning adapts to your unique stride and provides twice as much energy return. 4. HPR Plus Outsole: Durable outsole with aggressive lugs provides secure traction on variable terrain. 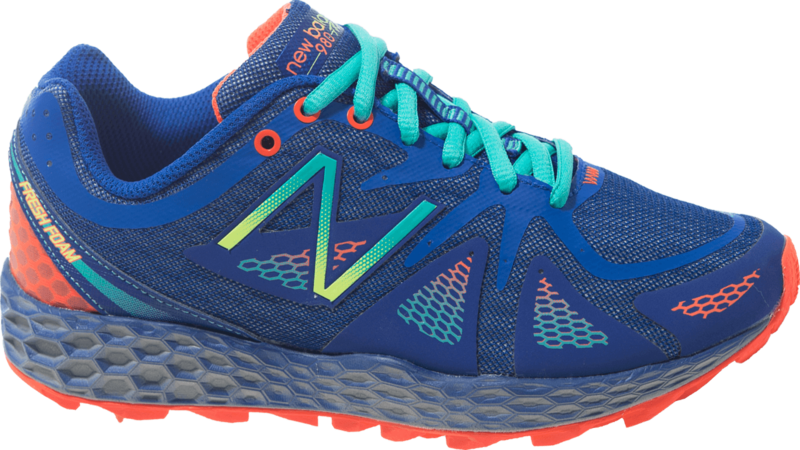 Inspired by low-profile, form-fitting climbing shoes, the New Balance Men&apos;s 007 Trail Running Shoe sports toe-to-top lacing and a rounded toe. The no-sew mono-mesh upper lets your feet breathe, while the padded tongue protects the top of your foot. The aggressively lugged outsole offers plenty of traction on muddy, loose ground. 1. Mono Mesh: Breathable mesh panels in the seamless upper provide maximum ventilation and minimal chafing. 2. Climbing-Inspired Upper: Rubber toecap and a full-length lacing system provide the precise fit required on steep, uneven terrain. 3. Lugged Outsole: Aggressive lugged pattern on the outsole provides secure traction on muddy and loose trails. 4. Padded, Gusseted Tongue: Offers a comfortable fit and helps keep debris out of the shoe. Head up the mountain in the lightweight yet rugged Adidas Men&apos;s Duramo Cross Trail Running Shoe. Its full-length AdiPrene+ midsole provides a surprising amount of cush and flexibility in such a light shoe, and the Traxion sole ensures proper grip on slippery slopes. The Duramo also features a speed lacing construction that wraps the breathable upper around your foot for a snug fit. 1. Adiprene+: Highly elastic and durable foam provides plush cushioning and a dynamic toe-off. 2. Traxion Outsole: Trail-specific outsole features a lug pattern that provides traction in all directions and sheds mud easily. 3. Functional 3 Stripes: Functional stripes engineered into the upper provide both linear and lateral support. 4. Speed Lacing: Provides a quick and secure fit and eliminates the hassle of untied laces. 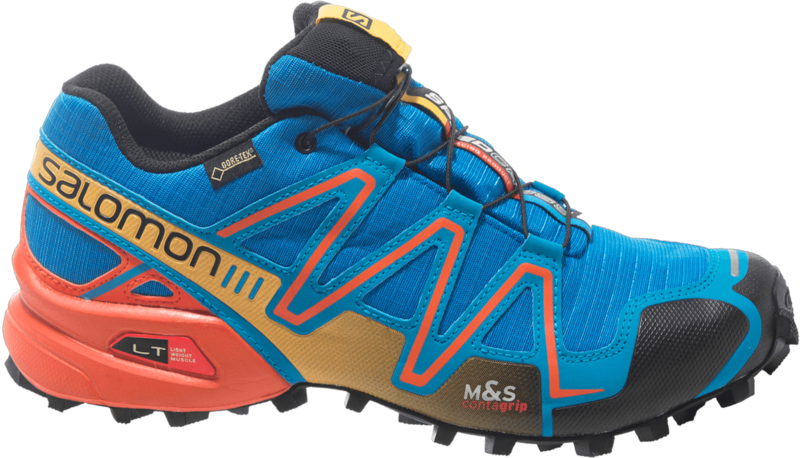 Backcountry.com partnered with Salomon to offer the Men&apos;s Speedcross 3 GTX Trail Running Shoe with a waterproof breathable Gore-Tex membrane and a colorway exclusive to Backcountry.com. This shoe offers the same aggressive trail running platform you&apos;ve come to expect from the Speedcross, but now you can charge across wet, muddy trails without soaking your foot. You get unshakable traction, a close and precise fit, and all the protection and support you need to run off the road, where the terrain is uneven and unpredictable. You won&apos;t find this version of the Speedcross anywhere else, so don&apos;t wait to add it to your collection—you never know if and when it&apos;ll be back again. 1. Gore-Tex Membrane: Provides waterproof, breathable protection in wet, cold weather. 2. Contagrip Outsole: Super-aggressive lugs are specifically designed for performance in mud, snow, and loose terrain. 3. Quicklace System: Provides a fast, secure, and precise fit; includes handy lace pocket for stowing the laces. 4. Ortholite Footbed: Creates a healthy, dry, and well-cushioned environment for the foot. As a Utah-based brand, Altra took inspiration from one of the most rocky, rugged mountains in the Wasatch Range when it designed the Men&apos;s Lone Peak 2.0 Trail Running Shoe. 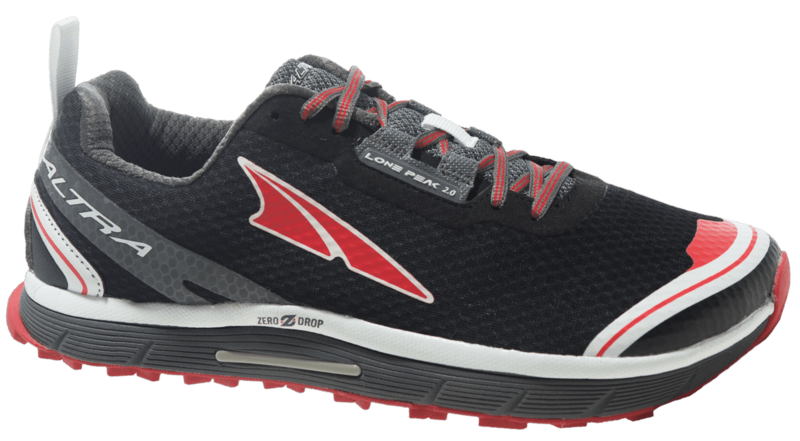 Like Altra&apos;s entire line of running shoes, the Lone Peak features a foot-shaped profile and a Zero Drop design. What makes the Lone Peak stand out is its toothy carbon rubber TrailClaw outsole that digs into all kinds of terrain, with lugs designed for both uphill and downhill traction. 1. 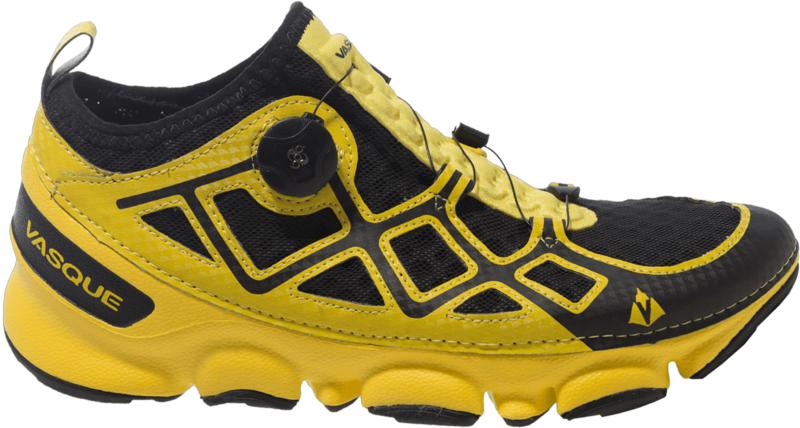 Zero Drop: Allows the foot to maintain a natural position while running and softens foot strike for reduced impact. 2. FootShape Toe Box: Allows the toes to relax and spread out naturally for enhanced stability, comfort, and a powerful toe-off. 3. TrailClaw Outsole: Sticky carbon rubber compound with lugs designed for both uphill and downhill traction. 4. Sandwiched StoneGuard: Flexible midsole layer protects the foot by absorbing the impact of rocks and other trail hazards. 1. ShapeShifter Last: Foot-shaped last with a wide toe box and 6mm of drop, designed specifically for endurance running. 2. 3D Stretch Mesh: Mesh sock liner conforms to the foot for a second-skin fit. 3. Boa Lace Sytem: Boa closure system provides a precise fit with the turn of a dial and eliminates the hassle of untied laces. 4. Morpheus Outsole: Segmented sole design swallows trail irregularities for the smoothest ride possible. The Saucony Women&apos;s Peregrine 5 Trail Running Shoe is ready to take on the toughtest trails, thanks to the EBO rock plates that handle rocks and other debris while still allowing full flexibility. 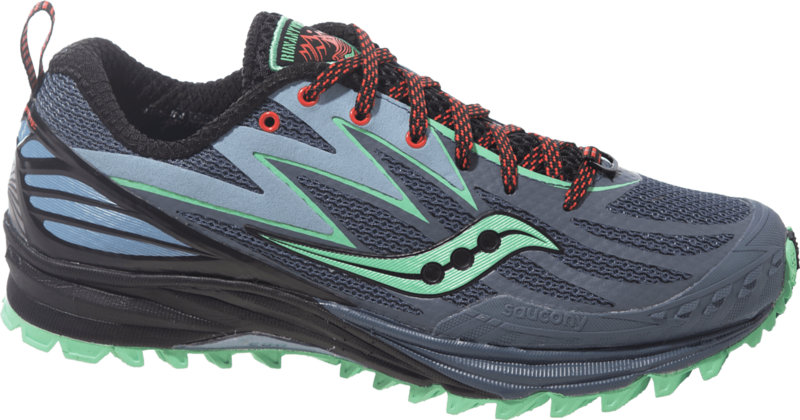 Saucony&apos;s PowerGrid midsole to provide 20% more cushioning than standard midsoles, especially at the heel strike, for a smooth ride. 1. PowerGrid: Midsole cushioning technology that absorbs impact at heel strike. 2. EBO Rock Plates: Midfoot and forefoot rock plates protect feet from rocks and other trail hazards. 3. FlexFilm: Flexible upper material that provides a precise fit and support without adding weight. 4. Multi-Directional Lugs: Aggressive outsole lugs are designed to provide secure traction, both uphill and downhill. The Brooks Cascadia 10 Women&apos;s Trail Running Shoe delivers comfort, grip, and performance that will have you stacking up the miles. It&apos;s a tough and light do-it-all trail master with a moisture-wicking lining, protective forefoot rock shield, and a lightweight but cushy BioMoGo DNA midsole to keep you cruising along with a smile on your face. Brooks&apos; grippy rubber sole integrates Crash Pad flex segments which promote natural foot rolling and make it easy to flex the shoe. 1. BioMoGo DNA: Innovative midsole cushioning adapts to your unique stride and provides twice as much energy return. 2. Pivot Posting System: Four-point posting system in the heel and forefoot improves feel and response on variable terrain. 3. Ballistic Rock Shield: Protective plate in the forefoot distributes the impact of trail hazards. 4. Segmented Crash Pad: Independent shock absorbers in the midsole provide the right amount of cushioning with a seamless heel-to-toe transition. The New Balance Women&apos;s NBX 980v1 Trail Running Shoe ensures a natural stride over rough terrain thanks to the Fresh Foam midsole. Fresh Foam takes the impact off your foot without adding weight, and a moderate drop helps you run as if you were on a sidewalk. New Balance also added a lightweight seamless upper and a protective gusseted tongue that keeps pebbles out. 1. Fresh Foam Midsole: Plush foam midsole delivers maximum cushioning and a natural feel underfoot. 2. Blown Rubber Outsole: Durable, lightweight, and aggressively lugged outsole offers secure on-trail traction. 3. No-Sew Construction: No-Sew material application lends a comfy, sock-like feel. 4. Synthetic/Mesh Upper: Provides trail-worthy durability with ample ventilation. 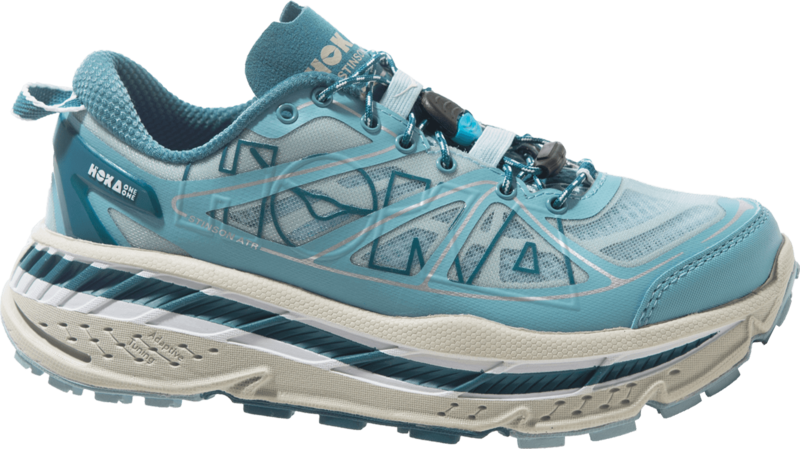 Hoka One One made its name with maximalist running shoes, and the Stinson ATR Women&apos;s Trail Running Shoe is firmly in that tradition. Most noticeably, it features an oversized HIP CMEVA midsole that provides top-level cushioning and support and a late-stage Meta Rocker with 6mm of drop, providing plenty of forefoot support and enabling your foot to move quickly from heel strike to toe-off. The TPU heel counter provides an additional dose of support, and the lightweight Speedframe upper was constructed without traditional seams. 1. CMEVA Midsole: Industry-leading oversized midsole for the maximum in comfort, cushioning, and foot protection. 2. Late-Stage Meta-Rocker: Midsole geometry is sculpted to create a stable ride and help you move quickly through your gait cycle. 3. SpeedFrame Upper: Three-layer welded support frame provides a secure, seamless connection between the foot and the upper. 4. Race Lace System: Make on-the-fly adjustments and say farewell to untied shoelaces. Have questions about the products featured here? Connect with Expert Gearhead Geoff Conner to get all your questions answered. Email, call Geoff at 801-736-5313 or connect directly. Connect with Expert Gearhead Geoff Conner to get all your questions answered. Email, call Jared at 801-736-5313 or connect directly.